The film takes us into a heady world of insur­gent sleep­ers’ com­mu­ni­ties as well as the infa­mous ‘sleep mafia’ in Delhi where just secur­ing a safe sleep­ing spot often becomes a ques­tion of life and death for a large number of people. The film trails the lives of two indi­vid­u­als, Sha­keel and Ran­jeet. Sha­keel, a rene­gade home­less sleep­er has for the last 7 years slept in a diverse range of impro­vised places like sub­ways, under park bench­es, park­ing lots, aban­doned cars and lately, at areas con­trolled by the sleep mafia. The film fol­lows his attempts to secure a safe sleep­ing space just around the time the infa­mous winter rains of Delhi are due. 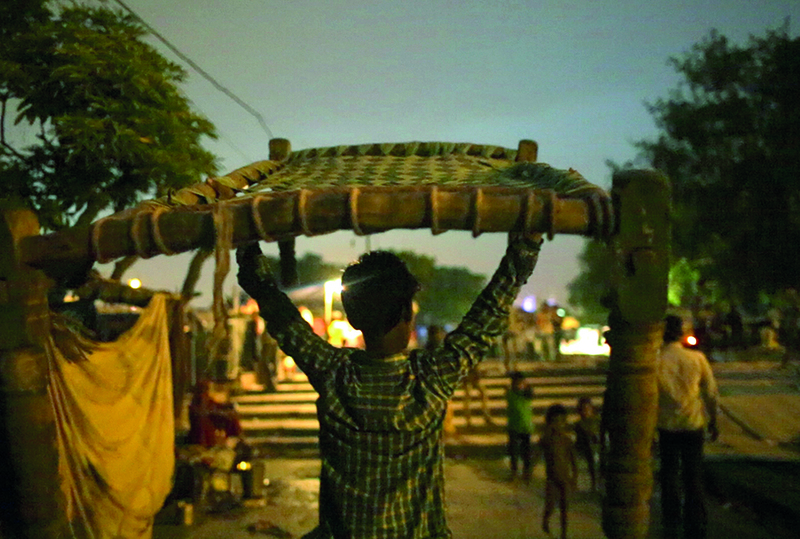 Ran­jeet runs the ‘sleep-cinema’ com­mu­ni­ty in Loha Pul in Delhi, a huge double-story iron bridge strad­dling the banks of the river Yamuna. A thin strip of land under Loha Pul houses shanty cin­e­mas, where over 400 odd home­less come and sleep through the day for a nom­i­nal price. The flood­ing of the river Yamuna poses a threat to the people sleep­ing there every mon­soon. The film looks at not only the tremen­dous social and polit­i­cal pres­sure that sleep exerts on the home­less in the city, but is also a philo­soph­i­cal explo­ration of sleep at large.